Boasting a 40 year run as a syndicated comic strip character, big mouthed, broad shouldered broadcaster Tank McNamara easily bogarts his way into today’s blog with his “norts spews” or sports news. Sure, I may have personally given Tank a mulligan – or two – or thirty when considering this bumbling, brash and bumptious local television reporter of comic strip fame. 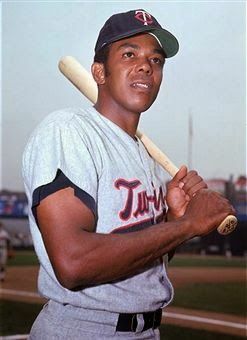 But, his inclusion in today’s blog as well as in my sports comic book Favorite Sportscasters stems from the brilliance of two men who brought this imperfect talking head on sports to life. Until his 2012 passing, writer Jeff Millar and artist and now writer Bill Hinds gifted the American sports loving public with this magnificent creation. Since 1974 Millar and Hinds have employed the overly confident Tank McNamara to lampoon the absurdity of sports. However, the square jawed reporter, famous for his fumble mouth pronunciations like “norts spews” instead of sports news, quickly and frequently gets cut down to size. Millar and Hinds expertly crafted the seemingly self-assured sportscaster into a buffoon of a former football player, beloved by readers of as many as 300 American newspapers. 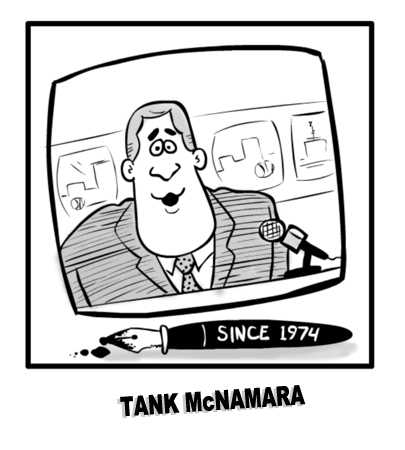 In spite of his warts and easily deflated bravado, Tank McNamara remains a fan favorite. Loyal readers can easily recite the brute’s football bio from his fictional alma mater – Enormous State University – to the same #55 jersey number he wore as a college Sandcrab player and later as an NFL defensive lineman. Distributed by Universal Press Syndicate, the Tank McNamara character seamlessly weaves commentary and illustrative artwork into American culture while furnishing a biting satire of today’s sports world. From gambling to steroids, domestic disputes to felonious arrests and from breaking news on DUIs to sexual misconduct stories, Tank McNamara poignantly pricks all societal ills. Tank McNamara’s snarky humor reaches its annual peak when creators ask readers to nominate their choice for Sports Jerk of the Year. In the less-than-perfect world of sports entertainment, there is usually no shortage of candidates. And, with a flawed former football player named Tank McNamara reporting on the winner of Sports Jerk of the Year, it’s easy to understand why this likeable lunk finds his way into my sports comic book Favorite Sportscasters. Click above to download the book from Amazon to read about Tank and other “norts spews.”.